Royal Celebration has added another win to his record with trainer Ron Quinton to give him a break and bring him back for stakes races in the autumn. Royal Celebration has confirmed his status as a future star with his second consecutive victory after a sequence of seconds behind a couple of promising three-year-olds and one star. Trained by the astute Ron Quinton, Royal Celebration ($2.15 favourite) was taken back early behind the speed set by Baller and stormed home to catch Coterie ($7.50) and win Saturday's ATC Membership Handicap (1400m) by a long head. The colt's seconds have been to subsequent triple Group One winner The Autumn Sun and stakes placegetters Gem Song and Yulong January. "It's hard to know how far he can go but he did run second to The Autumn Sun," Quinton said. 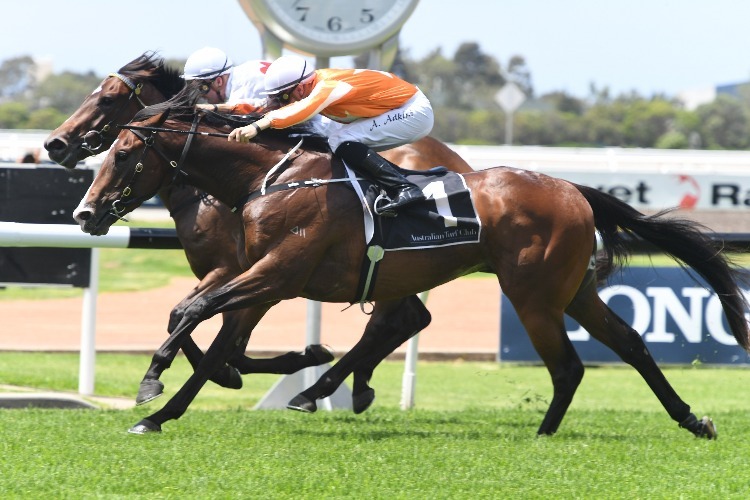 "And when you talk of The Autumn Sun, I think he's the next best horse we will have in Australia. "This bloke is still learning and has more improvement to come. "I'll put him away now for a short break and he will come back in the autumn. "There's a million-dollar Inglis race in February which he will run in fresh and then we'll see after that." Quinton decided not to take Royal Celebration to Flemington for a Listed race on Saturday, saying the it was just as lucrative to stay at home. "He get's $58,000 for winning this race and another $38,000 BOBS bonus," he said. "It's unbelievable and this way he doesn't need the stress of travel." His jockey Andrew Adkins also believes the colt can be a future star. "He was really good today and just gets better," he said.